We look forward to welcoming you to Crowne Plaza London St. James. The hotel is a traditional delux four star in central London. Close to Buckingham Palace, The Houses of Parliament, the London Eye and Victoria Station, the hotel couldn't be better positioned for your business and leisure needs. This four star deluxe hotel offers supremely comfortable accommodation, excellent service, high speed internet access and extensive meeting facilities.You'll be spoilt for choice for somewhere to eat at the Crowne Plaza London St James. The hotel boasts three excellent restaurants. Bistro 51 provides British and European cuisine, the award winning Indian restuarant Quilon serves south coastal Indian food and Bank Westminster has a modern British menu.Spa at 51 is our spa, with gym facilities, available for use by all our guests. Unwind with a luxurious, 100% organic, Sodashi face or body treatment. 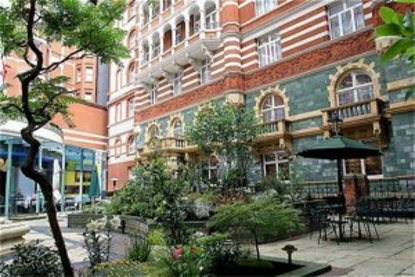 Alternatively, submit to the rigorous demands of a personal trainer.Afterwards, walk through our beautiful, award-winning, courtyard garden, surrounded by the Victorian buildings of the Crowne Plaza London St James. A peacefull oasis in the centre of London.